Dangote Tomato Processing Plant has resumed operation after suspending production about two years ago due to lack of raw materials. Africa's biggest tomato plant in the commercial city of Kano suspended production one year and five months after it was launched. The supply disruption was also partly caused by a price dispute with farmers. Bloomberg reports that the factory, with a capacity for 1,200 metric tons of tomato paste daily which is targeted at meeting domestic demand, restarted production last week. It processed about 100 tons a day and will ramp up output as tomato supply improves. 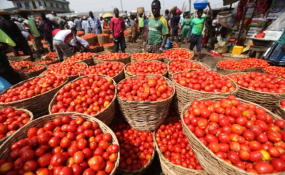 "Our major challenge is the scarcity of the tomato that would be sufficient for our daily production," Kaita said in an interview at the factory in Kadawa, outside the northern city of Kano. "The local tomato growers could not meet our production demand; we also could not agree with the farmers on the price of tomato per basket." Bloomberg quoted the managing director of Dangote Farms Ltd, Abdulkareem Kaita as saying. The factory now has a new deal with the farmers where they (factory) will buy raw tomatoes at prices pegged to what local markets are selling. Dangote is also developing on its farms a special tomato strain that could yield 60 tons per hectare, compared with the yield of 10 tons per hectare being recorded by the local farmers, Mr Kaita said. The company plans to distribute the seedlings to growers to boost their output. This is coming after the minister of agriculture and natural resources, Audu Ogbe said the federal government would place a ban on the importation of tomato paste before the end of 2019. The officials said Nigeria spends about $22 billion on tomato paste importation annually.